Q: Some stall speeds are specified with the occupants in the full forward CG position. This does not seem like it’s a conservative specification, i.e., if the occupants move rearward, that would tilt the plane backward, causing an increase in angle of attack, causing a higher stall speed. What am I missing here? 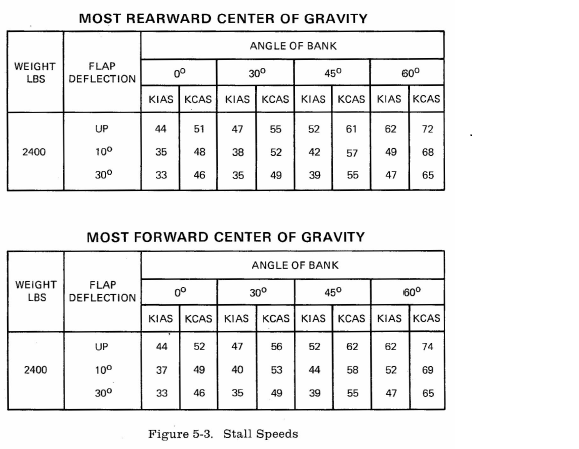 A: I’ve seen planes with the stall speeds specified for “Aft C.G.” (our club 172L POH shows that), “Forward C.G.”, tables showing stall speeds for both situations, and ones where the conditions for the stall speeds are not specified. First, let’s be clear to call it the center of gravity (aka C.G.). While occupants are a consideration in C.G., it includes occupants, baggage, fuel, and the empty airplane (and sometimes things like oil). While it’s true that any movement in flight of a person or baggage can trigger a pitch change (see the recent crash of a 747 in Afghanistan thought to be caused by a shift of cargo), that movement is not what we’re talking about. We’re considering the position of the center of gravity in a steady state. In most normal planes, the forward C.G. position will equate to a higher stall speed. Why? Remember that the normal situation in our airplanes (canards are different) is that the center of gravity is ahead of the center of lift. In order to “balance” the airplane, the tail generates a downforce in flight. As you move the center of gravity forward, you lengthen the “arm” over which the center of gravity operates – that means to stay balanced, the tail must generate a greater downforce (since you can’t change the length of its arm). That extra downforce increases the effective load borne by the wings. You haven’t increased the weight of the airplane, but you have increased the load on the wings (much like a high G maneuver might do). 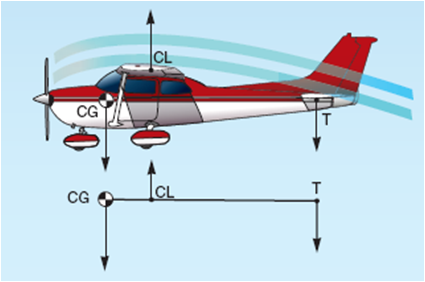 The only way to continue level flight is to increase angle of attack in order to increase lift – that means that for the same aircraft weight, a forward C.G. will cause you to fly at a higher angle of attack and thus closer to the critical angle of attack, and therefore you increase the stall speed. If I’m reading correctly, I see a maximum increase of 3kts (about 6%) on the indicated airspeed and 2kts on the calibrated airspeed. Your mileage may very. Very interesting; great diagram and explanation and mention of sensitivity. Had not considered the downward force on the tail. The diagram suggests that the downward force on the tail (assuming it’s not a T-tail) may be larger for high-wing airplanes than for low-wing airplanes. Thank you for explaining this so well….